So to wrap up the idea - If you give a quilter a fabric collection, she can make a primary quilt, a secondary quilt, a tertiary quilt, possibly a quarternary quilt, & finally a crumb quilt. Yay, I got through the ring... I haven't got to the Maverick's yet, but my class is about to start & I got here an hour early so that I could get through Stash Quilts! You gals keep up the good work! Tropical Screamer said, "When I first started picking up fabrics, all I wanted to buy was blue batiks. Then I started buying different colors of batiks. All plain.Now they are my least favorite fabrics. I still love batiks, but now I want patterned batiks. And patterned cottons. The fabrics that I thought were my favorite are my least favorite for quilting.Funny how your taste changes as your quilting style evolves, isn't it?" I now Love Asian Prints.... I have a love/hate relationship with batiks - they are feeling muddy to me right now.... I will always LOVE my cat prints. I made a cat charm quilt with 605 different cat prints, it still makes my heart smile to look at it :o) I can't have it on my bed often as I get in a trance looking at all of those sweet kitties. There are other prints that I don't particularly care for, but that I use to "Stretch myself." A growing exercize.... Like I did a 100% Robyn Pandolf, I have 1 Thimble berries quilt in my future, I am doing at least 2 Civil War repro quilts, and the 30's quilt that is near the top of my current working list. & to think I thought my computer was slow.... This one is painfully slow - but apparently adequate. So I am going to make the baby quilt, get my novelty charms for my "I Spy" (s) I have enough for several..... and then figure out of to make "Moose Muffins" out of those 30's! 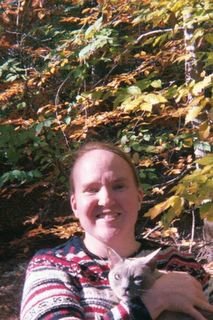 For my last blog today, I'd like to thank DebR for helping me with technical stuff like getting my picture on the side bar! And to Barbie for helping me with adding side bar stuff. And now I am off to a quilt store closing sale.... Quilt-n-Stuff in Alexandria, VA. has had a very nice selection of Asian, ethnic, & batik fabrics & will be missed. You can see exactly where that is on my frapper map. http://www.frappr.com/thecalicocat please do join my map, so I can see where you are as well. How would you quilt this & where am I? How would you quilt this? I am thinking concentric circles centered over the pinwheels? As always I have a story.... (First thanks to all who gracioulsy swapped batik nickels with me, without you this would have been paifully more expensive!) This pattern is in Nickel Quilts by Pat Speth. Her version has a checkerboard background & she mixed regular cottons with the batiks. Mine is all batik and all of those dark background batiks are different. To make the light (repeated a few times - not a lot off light batiks were available in my stash or at the store when I was piecing this) pinwheels pop, I had to sort my charms into dark, medium dark, medium light and light. I then paired dark with medium light and medium dark with light. I am happy with the results. Now for a funny story. You might not be able to tell by the quilts I have shared, but most of my quilts either have cats or Judaic themes. (You have seen at least 1 of each already.) So when I had this top pieced I whipped it ot for my girlfriend who noticed my trend and stated it... Stating. "Here is a quilt with out cats or Judaica." - in my mind it is a batik quilt. Lo and behold - those are cats in the border & there are a few cats in the pieced parts too.... :o) BTW This big picture came off my throwaway camera - I had a Photo CD made when I got it developed. Thanks to the customers at Capital Quilts in Gaithersburg, Maryland who held up my quilt so I could get a photo. The shop had a batik celebration & I got a free fat 1/8 for sharing my quilt. I also go more batik fabric - they had a nice sale that day. I got the back, border & binding for my wedding signature quilt. Those blocks are done - just waiting for the big day for the signatures to be added! 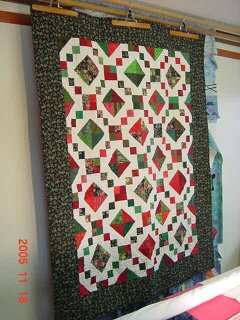 I used a pattern that was published in "Fons & Porters Love of Quilting" magazine this past summer. Now for the where am I portion of this blog.... I am going to be in training for two weeks. My computer time will be limited to say the least. But I will have some access - just not enough for a photo enhanced blog post. (Well may be on the weekend...) I'll still check my e-mail regularly. Once upon a time ago, fabric shopping made me feel better (& you wondered why I joined stash quilts). So I went to a quilt shop that doesn't necessarily fit my style (They are more country & I am more bright) thinking that just looking would be enough. They had a sweet little quilt pieced and kitted up... I bought it and a matching back/binding print. Knowing that I wasn't going to piece it anytime soon & that the fabric would not be available when I wanted it. When I finally got around to piecing it (after a long lull in my quilting) I made a YBR that got me back inthe swing of things and then decided that this too was a quick & easy one and so I should do it too. Unlike Finn's (Sorry I can direct you to her blog - but she is in this ring) 100% flannel quilts, this one has a cotton batting and is machine quilted. It is also in my gift pile... I was going to send it to my future BIL but he is TALL! Another couple words on Maverick Quilting.... I hardly ever trim my blocks or block units.... I just eyeball the 1/4 seam between the blocks. 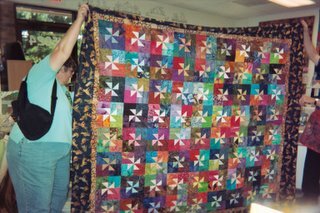 Some are closer to 1/2 thers are scant 1/4.... And then there is "Value" in my quilts it is overrated... If I am making a blue & yellow quilt - I don't pay attention to the fact that the block would prefer light, medium & dark, I use blues form sky to navy.... I Love the quirkyness of it. The worst part - my pecan pie did not set up. It was like ice cream topping..... Any advice on Pecan Pie out there? Again, sorry that the photos are so small.... This is my wedding canopy. The quote in written Hebrew (If you can even tell there is a quote) is translated into English as "And I betroth you unto me forever in righteousness and in justice, in loving-kindness and in compassion." Hosea 2:21. And a short explaination of what a wedding canopy is.... The wedding ceremony takes place under the chuppah, a symbol of the home to be built and shared by the couple. Like the tent of Abraham and Sarah, the four sides are open to indicate all are welcome into our home and our lives. As a temporary structure, the chuppah reminds us of the fragility of life. I had fun making this quilt. I started the center star during Hurricane Isabel. (I did not lose electricity or have any damage and for that I am thankful.) I went OVERBOARD to say the least. as a matter of fact on the back it looks like 1000 pyramids in the center. I knew I wanted to applique the quote (ultra suede by hand) so I glue tacked them in place and started. (And then I started a lot of other things...) Finally I started dating a guy that I thought was Mr. Right - I even moved in with him... and we went to California to meet his mom. I worked on the applique on the plane. (Needle & thread only) & then it sat. And I started a lot of other stuff. I finished a lot too. Then I met Michael & his mom & brother... and the blissful feeling of "he is the one" over took me again and I started to work on the wedding canopy - I knew once I get engaged I would not have any time - so I wanted it done before hand = one of those hope chest things. I finished the applique and fell in love with Paula Nadelstern's fabric, so I just bordered the center. I knew I wanted more applique so I added a white border and some celtic applique. I got the bias tape at Jinny Beyer's studio, it is kind of marbled and had an adhesive already on it. I machine zig zaged it. And then I was going to add several other borders, but I came to the realization that it was already big.... So I added the last scrappy border (You probably can't tell it is scrappy but that was partially the point - all the same value. Pat on the back as I am not always the best when it comes to value!) I figured out the stars from the Nickel Quilts book by Pat Speth - she has 1/2 stars as a border on one of her quilts. And then it came time to get it quilted... I hardly ever have any definate ideas on the quilting (I also figure that I am paying for this professional advice...) But some quilting is directional and this quilt has a top (based on the applique) but if you don't read Hebrew - can you tell? No probably not. So in my "bricks" (That is what I call the 2.5 x 4.5 unit that is in the border in blue) there is a circa 200o print that says "celebrate" in English. I told the quilter that that is the top (I forgot to put a pin the the top - so many of my quilts are not directional). So Judy looked on the interent trying to figure out what Celebrate looked like in Hebrew.... She had an aha moment when she found the "celebrate" brick. :o) Luckily the quilting is not directional - nor is the photograph. But I am sure that I will get a photograph or two of this quilt at the wedding in February. I am about to go start the cooking. Pecan Pie and Pumpkin Pie Crunch are on the agenda for tonight as is some serious sewing on a novelty star quilt. Star Fling is the pattern that I am using you can get a free copy here: http://www.pbtex.com/html/free_patterns.html bottom of the page. Mine will have a pink background, funky star points & novelty prints in the centers of the stars. More novelties in a/the border. Gift for my cousin's daughter, I hope to have it done in time for the wedding - so she can have something to lay on, lookat, etc. The same cousin is pregnant again - so I am doing a 30's charm quilt that I hope will end up unisex as we do not know if she is having a boy or girl yet. So I may piece that while working on the stars. Turkey tomorrow - I am going to try Safeway's two hour turkey recipe. I'll let you know how that turns out on Friday. Finally, we will be having cranberry sauce (whole berry in the can), green beans (plain), and a squash/pototo/yam mash. Wish me luck this is my first year to do it all! I was going to do a wedding post, but I need to wait for the digital negatives to share an engagement photograph. So I decided to share a photograph of my cats instead. On the left is my boy, RB (Rhythm & Blues) Arb when he is in trouble. Rhapsody is my girl. They are both Tonkinese. The Tonkinese blends the best features of its ancestors into one beautiful, medium-sized cat that is remarkably dense and muscular. Whether appearing in the coat pattern of its Burmese predecessor, with sparkling gold-green eyes, the pointed pattern of its Siamese ancestor, with glittering blue eyes, or the “mink” coat pattern seen in the show ring, with its unique aqua eyes, the Tonkinese is an intelligent, gregarious cat with a sense of humor. These cats are firmly convinced that humans were put on earth to love them; these are the cats that know they belong. RB is a retired show cat, so he is "breed standard." 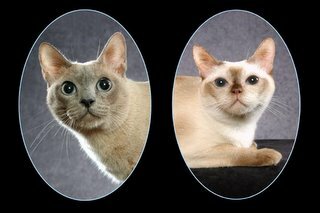 Rhapsody is a retired breeder, she has a burmese face & siamese color points - both traits are needed to keep the breed healthy, but neither traits are accepted for showing. I got her when she was 4 so she was not overbred. They are both now altered. FYI pricewise it would have cost more to get a kitty from the local animal shelter. Later I will share a quilt that I made inspired by them. Should I reply like this? I tried to reply to everyone individually - but I might have missed someone..... Should I edit the post that was replied to with an appropriate response? So many questions? (I am also now wondering do I blog first and then go read blogs? - Probably since I am up and at it early) I also need to controll my blogging - I have so much catching up to do! Frapper - thanks for being my pin-ups! Sorry that it takes you out of the ring - I tried to get a button, but only got he computer language to show up..... Frapper is a map - so we can all see where we are in the US so far - but I am reaching out as far as I can! I love frapper - it is so fun to see where everyone is located. I did make my own map http://www.frappr.com/thecalicocat & I would love it if you would join me. Some of you have seen this quilt already. It is my most recent completion. It is fairly representational of my style. SCRAPPY! (Should closeups be added in this post - any advice on how?) However I ususally use novelty prints. This is a gift for one of my bridesmaids. There is a virtual twin for my other bridesmaid - had to keep them "even steven." (I also have to remind myself not to tell them about my brand new blog so this gift will stay a secret!) The theme of my wedding & the quilt is Black & White and red roses. (The green is for the leaves and stems) I used the pattern from "Nickel Quilts" by Pat Speth. A Nickel is a 5 inch square charm & I trade them - variety is the spice of life! I traded for a few of these, but the majority came from my stash. While it is my intent is for this to be a quilty blog, it will also be my only blog (And I will have enough difficulty with it, without adding another & another...) so I will invariable chat about my cats & all of their cuteness & other things on my mind... (Luckily quilting is a major thing on my mind.) But so are my fiancee and soon to be wedding! That is normal, I have been told - I am a bit kooky (Colorful) or so I have been told! Any helpful advice on the blog (does blogger have spell check - my fingers seldom hit the key I tell them to hit - or they hit in the wrong sequence) with my quilts, cats and other stuff is welcome! As are blogging & quilting lessons!